부여군 임천면에 있던 보광사(普光寺)의 중창을 기념하여 건립한 비석으로 중창을 주도한 원명국사(圓明國師) 충감(沖鑑 : 1275~1339)의 행적과 중창 과정이 기록되어 있다. 원래는 충남 부여군 성주산의 보광사터에 있던 것을 1963년 국립부여박물관으로 옮겨 보관하고 있다. 비문은 2차에 걸쳐 새겼는데, 앞면은 건립당시인 고려 공민왕 7년(1358)에 새겼고 뒷면은 조선 영조 26년(1750)에 추가하였다. 비문에 의하면 원명국사는 19세에 등과하여 선원사에서 뜻을 펴오다가 공민왕 원년(1351) 65세로 입적하였다. 죽으면서 문도들에게 비나 탑을 세우지 않도록 당부하여 6년이 지나서야 비가 세워졌다. 뒷면의 추가된 기록에는 임진왜란 때 건물이 모두 불타 없어지고, 기록을 적은 비도 알아볼 수 없으므로 주지인 석능일이 고쳐 새긴다고 되어있다. 현재 비받침과 비머릿돌이 없고, 비몸만 남아있다. 비몸의 가장자리는 덩굴무늬를 띠 모양으로 둘러 새겼다. 석재는 편마암이고 윗쪽의 양끝을 사선으로 잘라냈다. ‘보광사중창비’라고도 하는 이 비는 고려 후기의 간략화된 석비양식과 불교사 연구에 좋은 자료가 되고 있다. 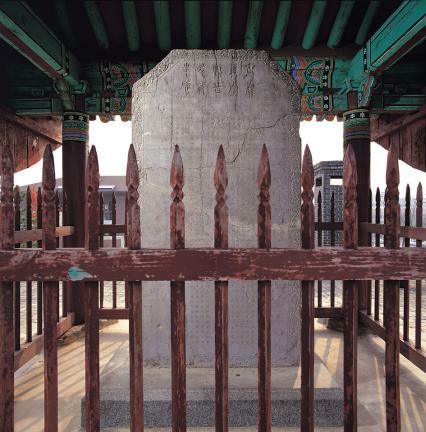 This stele was erected at Bogwangsa Temple for Great Master Bogwang (State preceptor Wonmyeong) who is credited with having renovated and expanded the temple. It was originally located in Seongjusan Mountain, Buyeo of Chungcheongnam-do but was moved to the Buyeo National Museum in 1963. 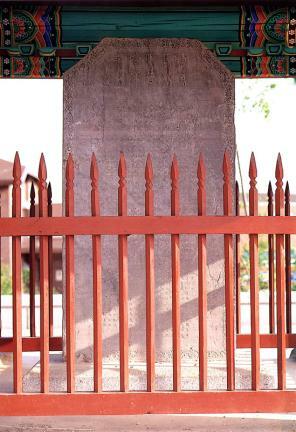 The inscriptions of the stele were written on two different occasions; the one on its front was inscribed in 1358 (the 7th year of the reign of King Gongmin of the Goryeo Dynasty) when the stele was erected, with the other on the back added in 1750 (the 26th year of the reign of King Yeongjo of the Joseon Dynasty). 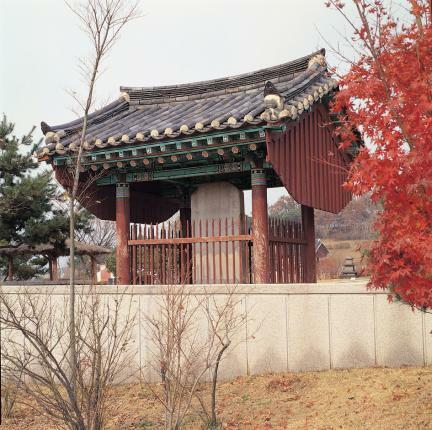 According to the inscription on the front of the stele, state preceptor Wonmyeong became a priest when he was 19, serving at Seonwonsa Temple until he died there at the age of 65 in 1351 (the 1st year of the reign of King Gongmin of the Goryeo Dynasty). It states that, since he left a will stipulating that his disciples should not erect his stele, this stele was not made until 6 years after his death. 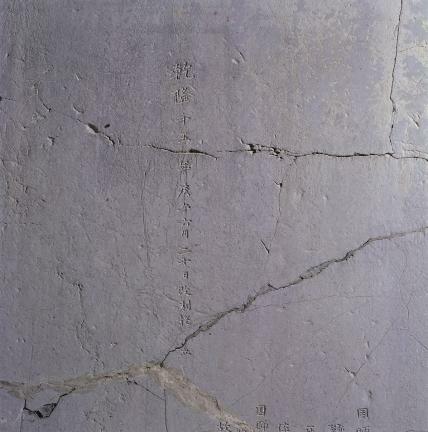 Moreover, the inscription on the back says that the temple was rebuilt after it was burnt down during the Japanese Invasion of Korea in 1592, and that the stele was inscribed again by Seok Neung-il, the head monk of the temple at the time. 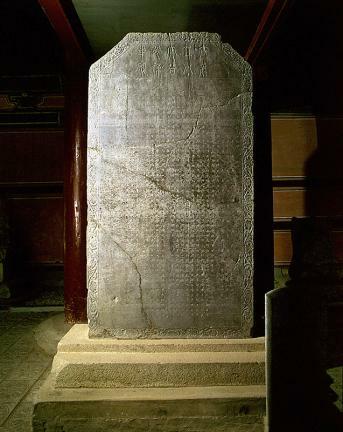 Only the body of the stele, made of granite whose top edges are cut, remains without the pedestal and capstone on top. Vined designs are engraved to adorn the edges of the memorial stone. 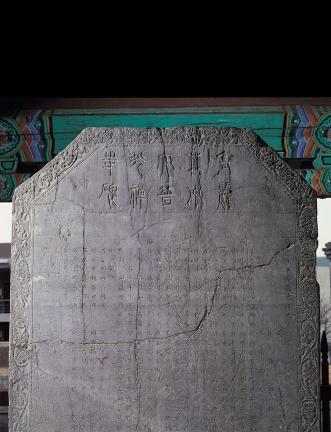 Also called "Stele to Commemorate the Restoration of Bogwangsa Temple," this stele is a good material for studying the simplified stele style of the late Goryeo Dynasty and the Buddhist history.